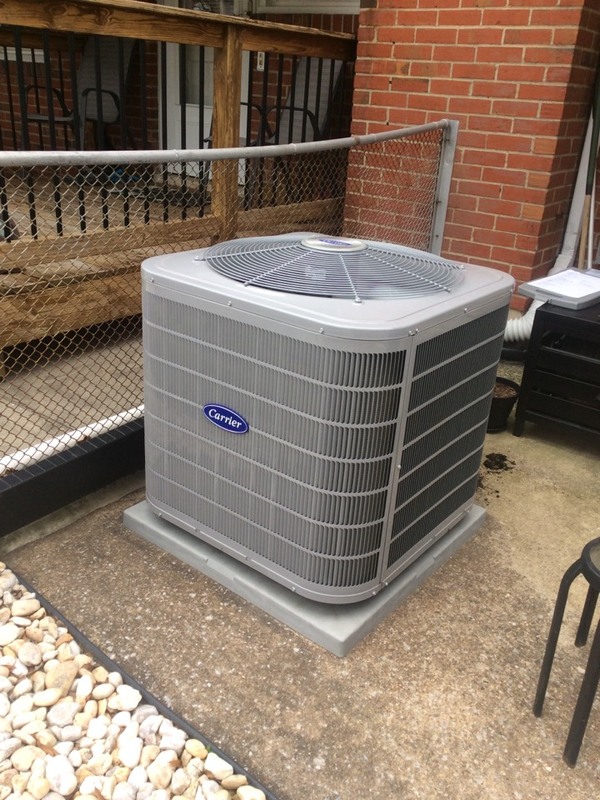 Supreme Air provides Air Conditioning, Heating and Plumbing Services, Repair, Installation, Maintenance, and Tune Up in Silver Spring, MD and surrounding areas. Technician Yonas Mengesha was great, explained everything he did. Would recommend to anyone based on this experience. Both the evaporator and condenser coils are clean, as well as the blower wheel and media filter. Blower is set on high speed for cooling and itâ€™s op properly so airflow is not the issue with the unit on cooling by 14.5 degrees across the evaporator coil. I placed gauges on the system along with pipe clamp thermometers and let the system run at least 10 minutes before taking my readings. Suction pressure low, discharge pressure low to normal but 32 degrees superheat. 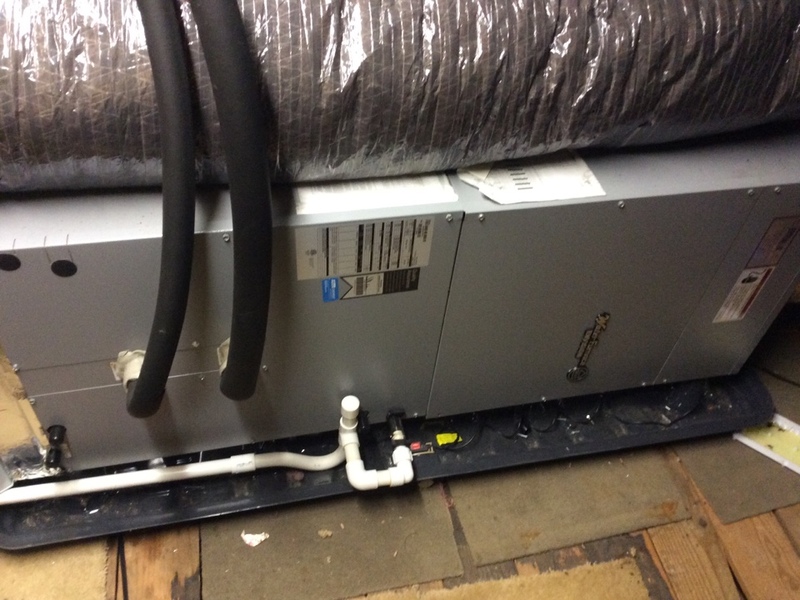 There is a refrigerant leak either in the system and most likely in the evaporator coil. The unit uses r22 so the EPA does not allow for topping off. I gave the customer 2 estimates, both include a leak search. One estimate to fix the leak if itâ€™s mechanically fixable and one to replace the evaporator coil. Both would include charging with conversion refrigerant. Customer is not sure what they want to do and also wanted a free sales estimate. A sales person is scheduled to come next Saturday, 04/27. I operated the unit on second stage cooling mode. Flow rate was proper as well as heat of rejection. I pressurized the ground loop to 65psi. I checked the electrical wiring and electrical systems, all were within specification except for the compressor run capacitor which was replaced. I then went to the air handler and decreased blower speed using the dip switches to quite the motor. Delta temperatures of 20+ degrees across the evaporator. I cleaned the condensate pan and drain lines and ran hot water to flush the debris out and to make sure it was draining properly. Unit operating normal. Wrong low voltage wires connected at the condenser unit. I had to go into the drop ceiling to make sure I was connecting to the right wires. I operated the unit measured delta temperature across the evaporator coil. Unit operating normal. I called the installation manager regarding some questions and was given approval to close out the invoice as a warranty call. It was installed correctly but never tested to make sure it was wired correctly. On arrival set units to call for cooling measured supply and return air temp measured voltage and amps inspected electrical connections checked drain and cleaned it ,checked all components.checked ductless system.also customer purchased new 24 v blue tube uv light . Spring Pm On 04/03/19 On arrival set unit to call for cooling measured supply and return air temp measured voltage and amps inspected electrical connections checked drain and cleaned checked filter cleaned checked condenser unit coil cleaned checked capacitor unit checked psi is good tested unit operating normal at this time. Recommended duct cleaning also Uv lights installation customer have problems with humidity I gave quote for customer his agreed with duct cleaning and humidifier installation he will call us when his ready. I operated the units on second stage cooling mode and recorded 20+ degree delta temperatures across the evaporator coils. I checked the electrical wiring and electrical systems, all are within specification. I recommend installing Intellistart on unit #1. I confirmed proper flow rate and hea of rejection. I cleaned the condensate pans and drain lines and ran hot water to flush the debris and to make sure they drained properly and that the condensate pump was working properly. Customer washed out pre filter for unit #1 while I was working. Unit #2 had a filter recently installed. Both units are operating normal. I recommended adding a Blue Tube ultra violet light and EZ Trap to Unit #2. On arrival checked both thermostat were calling for cooling. Measure return temperature, supply temperature, amps, voltage, electrical connections, blower wheel is clean, evaporator coil is clean, condenser coil is clean, electric filter is clean. Unit operating normal at this time. On arrival checked thermostat was calling for cooling. 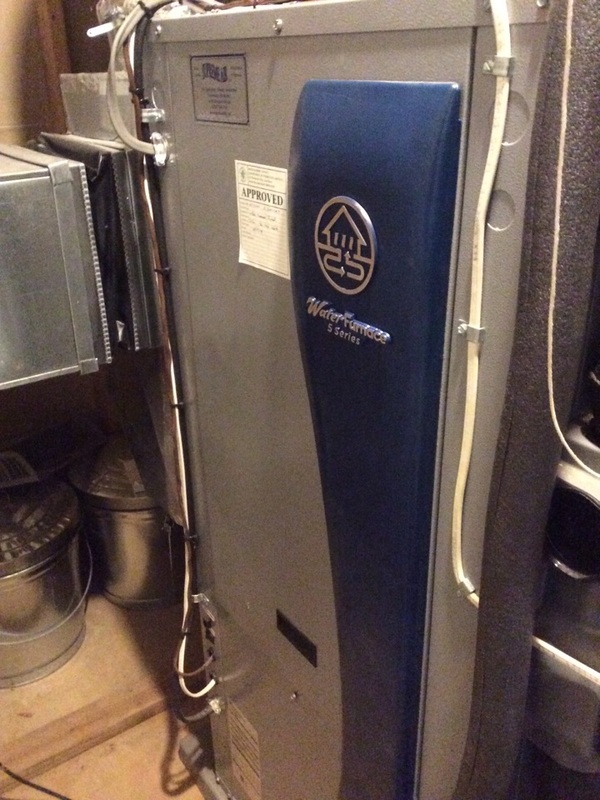 Measures temperature coming in, temperature going out, amps, voltage, electrical connections, replace dirty filter(16x20x1). Contactor, voltage absorption system. I also found a filter stucked in the return duct causing a restriction in the airflow. Removed it and replace dirty filter. Unit is operating correctly at this time. Find low voltage short and repair wire . I cut out wire that rubbed on a hanger in attic . It was on the outdoor thermostat wire . Re-connected wire and checked operations . On arrival found unit not operating normal due to a defective condensate pump. I replace it, tested it, and unit is operating normal at this time. Fall pm on 03/11/19 On arrival set unit to call for heat measured supply and return air temp measured voltage and amps inspected electrical connections checked drain and cleaned checked filter and replaced checked water pressure in and out unit tested unit operating normal at this time. I put my gauges on true suction and the discharge line in heating mode and cycled the unit. There was no difference of refrigerant pressures and the compressor turned off and on multiple times due to internal overload. I changed high pressure gauges to discharge line in cooling mode and cycled the unit in cooling mode and had the same thing happen. The compressor is not pumping the refrigerant. It has become internally damaged and must be replaced. I called the owner of the property and gave them the estimate and offered a service membership. Customer needs to contact home warranty company first before approving the repairs. I completed a part form (estimate) so that the correct compressor can be ordered once approval is given. At the thermostat I found the auxiliary heat differential set to .5,.5,&4.0. The auxiliary heat never came on and the compressor was running constantly never giving the water in the loop time to recoup heat. I reset to factory default setting of .5,.5,&.5. I checked to make sure auxiliary heat strips were working properly. I checked the capacitor and it is within specification. I ran unit on second stage heating mode. I reduced the pressure drop to 4 psi from 7 psi and checked heat of extraction. All normal. Temperature rise 30 degrees. Unit is operating normal. I recommend adding an Intellistart Module the compressor circuit. Customer skeptical of the benefits so they will read more about the benefits even though I tried my best to explain them. I made an estimate for this repair. Fall pm on 01/02/19 On arrival set unit to call for heat measured supply and return air temp measured voltage and amps inspected electrical connections checked drain and cleaned checked filter recommended air filter need to replace on time also need UV Lights Install unit operating normal at this time. Upon arrival I confirmed price with customer and explained the Intellistart so they knew what they were buying. Shut down unit and installed Intellistart. Wired with comfort alert and confirmed wiring with schematic. Returned power to unit and tested. Unit operating normal. Customer mentioned that they donâ€™t feel as comfortable at same temperature after pm service. Found unit operating normal with normal deltas at all components. Found humidifier has too much water flowing thru. Reduced water pressure at piercing valve so pad doesnâ€™t get over saturated and more humidity is produced.